Mumbai, Dec 24 (IANS) Aamir Khan's production venture "Dhobi Ghat", which is the directorial debut of his wife Kiran Rao, will be released in two versions - one completely in Hindi and the other with a few scenes in English. "The film has 8-10 scenes in English. But we realized that people who are not very comfortable with the language would be in a tough spot. So we dubbed those scenes in Hindi," Aamir told reporters here. "We will release the film in two versions. One will be completely in Hindi and the other will have the original English dialogues. People can choose the version they want to see," he said. The 45-year-old confirmed that both the versions will be released Jan 21. When asked the reason for two versions when he could have also gone in for subtitles, the actor-producer informed: "We didn't want to keep subtitles because a lot of people don't like reading while seeing the film and many people can't read, so dubbing was a better option." 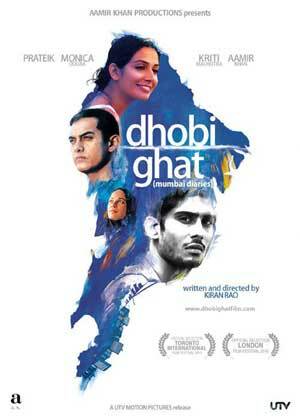 "Dhobi Ghat" that stars Aamir along with Prateik Babbar, Monica Dogra, Kriti Malhotra, Kitu Gidwani and Nafisa Khan is a film about four characters from different classes of society and how their lives are interwined. "I'm very happy for the film. Kiran has beautifully implemented what she intended to make. It's a very different film, an arthouse film that we haven't seen for a while. "It's a film about moments. Kiran has shot at real locations with a small crew, so it has a real feel about it. She has brought about the vibrancy and colour of Mumbai very well," he added.